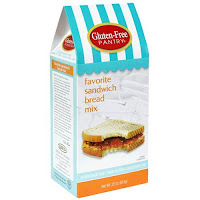 Ms. Celiac Says...: Some Great Additions To Any Pantry! One of my favorite brands of gluten free baking mixes that has been around for quite some time is by the Gluten-Free Pantry. This brand is part of the Glutino Food Group, which has a few other delicious gluten free lines as well. You can visit them at www.glutino.com. In addition to their gluten free baking mixes they also produce gluten free olive oil & garlic croutons and gluten free frozen products including chocolate chunk cookie dough delights and buckwheat raisin cookie dough delights. Gluten-Free Pantry products are sold at natural food stores throughout North America. You can also purchase them online at www.glutenfree.com or at Ms. Celiac's Market!